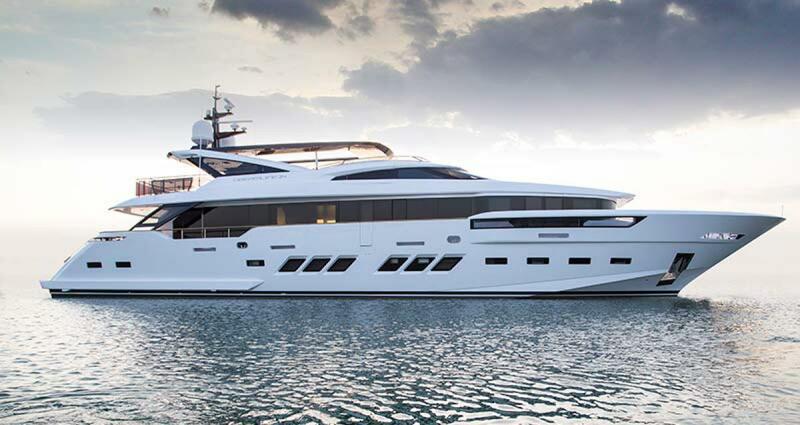 It's been one year since Dreamline Yachts introduced their 34M yacht at the Cannes Boat show. During the recent Cannes Show I took a trip to the Factory where I was able to spend more time learning the ins and outs of this unique yacht. I came away more impressed than ever. I'm Mike Smalley, Director of Sales for DL Dreamline Yachts distributed in the Americas exclusively by InterMarine Yacht Group. I am pleased to say the Dreamline 34M is a winner by any yardstick. Dreamline Yachts is a relatively new luxury European builder, offering custom yachts from 26 to 49 meters. I'm pleased to say business at DL Dreamline is strong with six 26M DL Dreamline yachts sold so far. The DL34M features all the core concepts that serve as the foundation of the entire Dreamline range of modern, meticulously designed and built motor yachts. We now have the second DL34M under construction with a delivery date in early 2017. With the critical success of the DL26M the Fano (PU) yard set their sight on building a larger yacht, the DL34M. Designed and built with unique content consistent with the philosophy at the heart of the Dreamline project developed by engineer Peter Zuber. Technological innovation and meticulous construction are the heart of DL Dreamline Yachts. Stylistically, the entire Dreamline range was developed by Enrico Gobbi’s T4 Design while Giuseppe Arrabito’s Arrabito Naval Architects crafted the naval architecture. The project was managed by Peter Zuber to meld aesthetic and functional demands into one sleek package. A large number of small but pivotal design touches, some introduced by the yard’s founder, mean that all the yachts in the Dreamline range benefit from solutions that deliver superior comfort and safety. Qualities usually only to be found on much larger yachts guarantee the Dreamline 34M’s owner and guests unusually high standards of comfort for a yacht of these dimensions. Noise and vibration levels have been reduced to almost zero and careful study of the structure and adoption of specific solutions including vibration damping is at its source. Indoor and exterior doors that “disappear” into the structure and a bridge on the Fly Deck that can be moved completely outside to give the captain access to the main command controls even during maneuvers in very tight spaces, are just two of many innovative elements that debuted on this new 34-meter vessel. Teamwork driven, by naval engineering and architectural research has played its role from the very earliest stages of the project’s development. Both have injected and continue to inject new life into high-tech yacht design, greatly enhancing the joy of being at sea into the bargain. The Dreamline 34M features some of the concepts debuted on the DL26M, including an owner’s suite on the main deck which, in this instance, has 270° views and access to a reserved deck area which is completely private because of a clever crew passageway and walkway design. As already stated, the yard introduces a bridge on the Fly Deck that can be moved outboard. This highly original solution is made possible by reliable, modern systems which allow all of the command instrumentation to be brought outboard. The result is, the captain has complete visibility when berthing and maneuvering in tight spaces. A solution born of necessity (skippers often need to have bridge wings that jut outside), combined with research into practical efficient yet aesthetically-pleasing solutions. The yard is in constant communication with owners and crews as it searches for inspiration for new solutions that will efficiently meet their needs. Everything aboard this new Dreamline vessel is the fruit of the best possible compromise between form and function with the former needing, of course, to guarantee owners and guests absolute comfort on deck and good-looking interiors in line with the overall aesthetic of the yacht. Function, on the other hand, guarantees comfort, safety, privacy and the opportunity to use the various areas of the yacht in a new and more comprehensive way. One prime example of this balancing of form and function is the Fly Deck, which aside from benefiting from a much larger surface area than on most yachts of this size, offers many other solutions that make it livable in almost any condition, be it riding at anchor, underway, in port or in open sea. There is even an aquarium for crustaceans. With regard to interior design, once again this is a full-custom yacht which means that owners not only can choose the furnishings and trims they desire but also the yard is prepared to modify parts of the superstructure (something it did, for instance, with the second example of the DL26M). This allows DL Yachts to satisfy the tastes and preferences of a diverse number of clients. That said, it can also count on a tried-and-tested naval platform with high performance efficiency figures. The 34M shown at Cannes 2015 has four guest staterooms on its lower deck. Two of these are VIPs amidships but there is also one double and one twin, all opening on to a shared corridor. Elegant color combinations and a wide array of luxury materials lend to a sophisticated, accomplished air. Notables include White Back-lit Onyx Tops which not only look extremely striking but also provide soft yet effective lighting. Luxury stitched leather is used to trim the walls, furnishing elements and even handles, all combined with polished stainless steel. There are also other details, their stunning visual impact aside, are highly functional. These include the bathroom doors in the two VIP cabins which are trimmed in the same leather as the bulkheads so that when they are closed they meld with the walls and when open, simply slide away into the bulkheads. The intention is that they should never interfere with the overall aesthetic of the cabin when not in use nor with the livability of either bathroom or suite when open. Similar solutions are also to be found in other door and window systems aboard. Like its counterpart in the 26M, the owner’s suite, for instance, has an automatic door that does not impede the side walkway when open but simply slides into the structure. Another instance of this level of sophistication is the large glass door leading from the cockpit to the saloon. It is made up of four sections which when open, turn the two spaces into one expansive indoor- outdoor area. The décor and furnishings are exceptional with very sophisticated pieces chosen, not the least of which are sublime works of art requiring specially-made pedestals and other supports, silk velvet- upholstered seats and Armani Casa fabrics for the curtains, sofas and other upholstery. Luxury Portoro marble is also extensively used for the bathrooms. As mentioned earlier, the owner’s suite is located on the foredeck where it enjoys uniquely sweeping views of both the sea as far as the eye can see and of the sky overhead, thanks to windows in the superstructure which have been shielded from prying eyes. The interiors are very generous and rationally laid out too. The feeling throughout is of a much larger vessel. Furthermore, there are constant glimpses and views of the sea thanks to plentiful windows and transparent elements specifically positioned to allow the eye to roam. The lobby amidships complete with day head and direct deck access, a mobile balcony on the port side and the other features described above are normally only to be found on vessels of 50 meters or more. The same philosophy drove the design of the crew quarters. In fact, the routes used throughout the ship by the crew were very carefully designed to guarantee both owner and guests complete privacy both day and night. The crew will enjoy a very high standard of living aboard even when they are on extended passages. The whole bow section of the hull is given over to the crew quarters which has been fitted out with the same care and attention as the rest of the yacht and provides ample space to allow the crew to relax properly when off duty. Once again with this new model, DL Yachts offers owners the choice of installing a hybrid propulsion system developed with Siemens to deliver particularly low fuel consumption figures. Its environmental impact is such that it is suitable for navigating protected waters. Added to all this is the engineering work done to ensure superb management of the onboard plant and equipment, complete with bypass and back-up systems that make for complete security and safety at sea. The Dreamline range features 26 to 49-metre models in a choice of either composite or aluminum. They are fully customizable to guarantee that each yacht is absolutely perfect for its owner. Lastly, they are supported by a modern, efficient platform and a design that will retain its freshness over time.